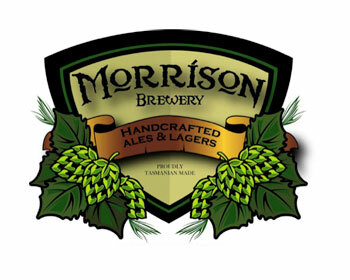 Morrison Brewery is an award-winning craft brewery located in Launceston, Tasmania. Our core range offers something for everyone. An Irish Red Ale (AIBA Silver), English Bitter (CBA Bronze), American Pale Ale (AIBA Silver) and an Irish Stout. This is Morrison's flagship beer. It is a smooth, medium-bodied take on the style with a beer that is all about the malt, with flavours that range from sweet caramel through toffee to toasted malt with just enough bitterness to tidy it up at the backend. Morrison's second beer inspired by Irish traditions is this stout, which is very much of the dry variety. Lightly carbonated, opaque and as close to black as makes no difference, there are aromas of cocoa, while in the mouth look out for some dark treacle too before the lingering back palate roasted bitterness comes into play. This is Morrison's take on the relatively low alcohol English pub bitters prevalent across the UK. Golden in colour, it gives off aromas of soft malt floral hops. There are some pleasant earthy hop flavours in what is a balanced beer with a soft lingering bitter finish. perfect for easy-drinking in the summertime. Pale, Munich, Crystal and Wheat provide a golden colour and a medium bodied malty base. Using the Ella hop, a half-sister to the more well-known Galaxy hop, provides floral, spicy aromas and flavours, a welcome change in a world of fruity, resinous Pale Ales. At 5% ABV it’s easily approachable and extremely refreshing. Numerous limited releases throughout the year let us express ourselves through other beer styles, including an English Summer Ale, Black IPA, Blueberry Gose, Czech Pilsner, Kolsch and American Brown Ale. We’ve done a Malt series, Tea series and even a roasted vegetable winter ale. Then there’s the slightly more adventurous Thai green curry and rice Saison and the Smoked chilli black IPA. If you’re in Launceston of a Thursday, pop into Saint John Craft Beer bar for a real pint of cask ale on hand pump, one of the very few venues in Australia pouring genuine cask-conditioned ales. In the past, we’ve bottled beers representing our offspring. Angus, a barrel aged strong Scotch Ale. Charlie, a barrel aged Barleywine. Jack, a barrel aged Doppelbock, and Ellen, a pomegranate Berliner Weisse. Our Saison (see below) makes an appearance each year as our summer release while winter is all about big bold flavours such as our award-winning ‘Batch 400’ barrel aged Russian Imperial Stout. Morrison Brewery is located in Launceston, Tasmania – gateway to a number of attractions including the Tamar Valley, Cataract Gorge Reserve, Queen Victoria Museum and Art Gallery, Design Centre Tasmania and a large range of wineries.